How to Smoke Salt, and Why You Should! First, the stuff tastes fantastic. It’s a perfect finishing salt to add to tomato soup, or on top of an avocado – or anything you want to impart a smokey kick. It’s as good, if not better than some of the gourmet smoked salts you buy in the grocery store. Second, it’s far cheaper to make this at home. Some of the fancy finishing salts are super expensive. Get as fancy as you want to be with this and still save a load of money. And if you need one more reason, these make great gifts! 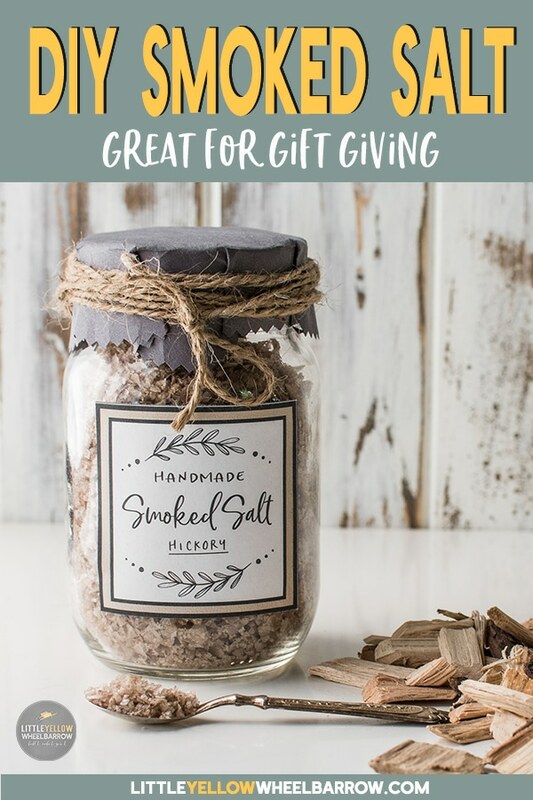 It’s the perfect host/hostess gift, especially if you are going to a BBQ this summer. A great gift for any BBQ lover or foodie on your holiday gift list! I’ve even included the labels so you can print them off and make your own fancy bottles to give away. You can find the download toward the bottom of the post. But honestly – I don’t think you will give them away. I think you’re going to hoard your smoked salt in your cupboards. So what is the best salt to smoke? Sea salt – the flakier and chunkier the better. My go-to choice is Maldon because that is my favorite salt by far and it is thin and flaky, perfect for smoking. But you don’t have to buy expensive Maldon salt either, we did smoke up some coarse sea salt, and it worked just as well. Maldon makes a smoked salt, but I find the smokey flavor is very dull, very non-existent hence the DIY BBQ adventure. You can smoke fine sea salt too, but honestly, I find smoked salt is more a finishing salt. Fine salt doesn’t add that crunch, and I find it doesn’t add that punch of fire roasted smokey flavor. 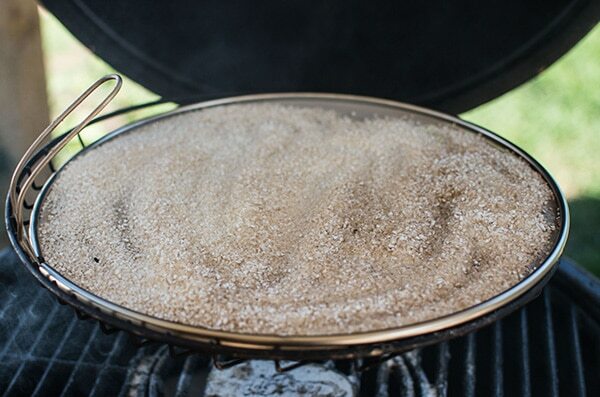 What’s the best wood to make smoked salt? Applewood – by far our favorite. 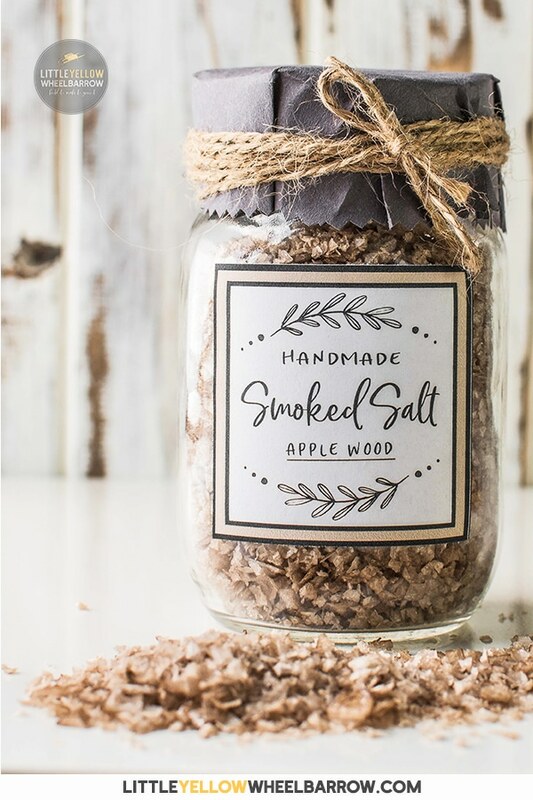 After trying several different kinds of wood on several different salts, we both agreed that the applewood smoked salt was the best. Don’t get me wrong, the rest of the woods made fine tasting salt too, but the applewood was superior. I found applewood to be the most versatile of all the smoked salts we’ve tried. It imparted the best clean smoke flavor that paired well with everything. With that said, I also have to say that never made a smoked salt that I didn’t like. Hickory, cherry, rum barrel, maple bourbon barrel, all worked perfectly well. Like anything that has to do with food, this is a just a personal preference. Honestly, smoking a batch of salt is super easy, so I recommend trying a few different kinds of wood to find what you like the best. But if you don’t want the fuss of experimenting, go with applewood. 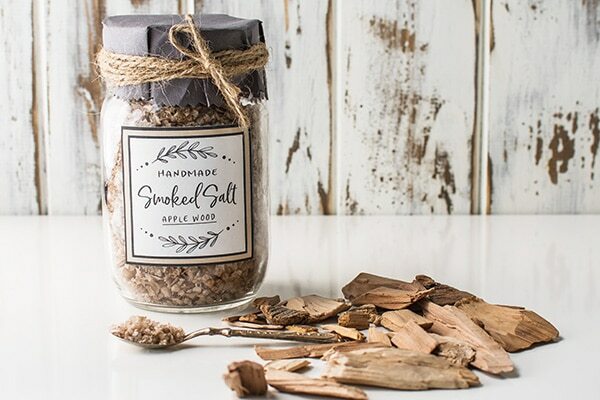 It does make a tasty smoked salt – you can’t go wrong if you start out with applewood. 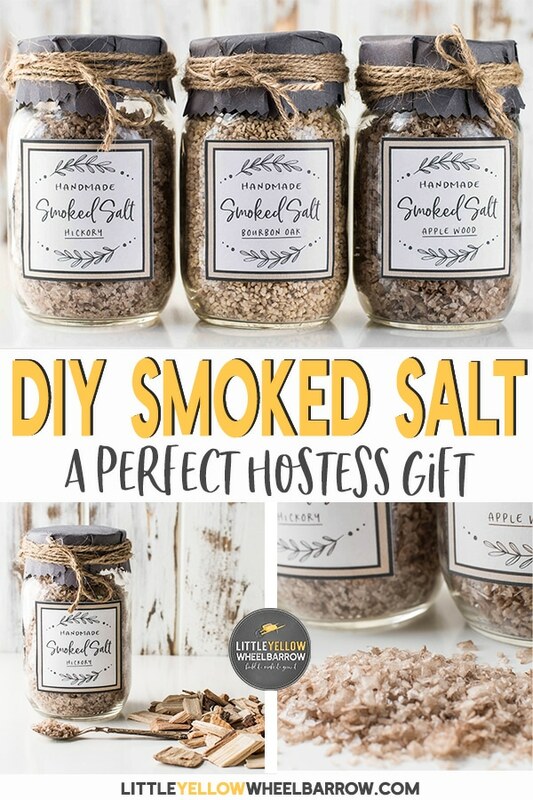 What temperatures are needed to make smoked salt? We’ve smoked salts at 250F and 400F, and I have found that the only thing that changes is how long you have to smoke your salt. At 250F we smoke for 5-6 hours – at 350-400F we smoke for 2-3 hours and end up with the same result. I did read a recommendation that you should cold smoke your salt for 12 hours. Tried that, what I ended up with was an incredibly powerful – over the top – acrid smokey salt. I did not like it at all, but if you want something stronger, add a few hours to your smoke. My advice – smoke it at 350F for 2-3 hours. 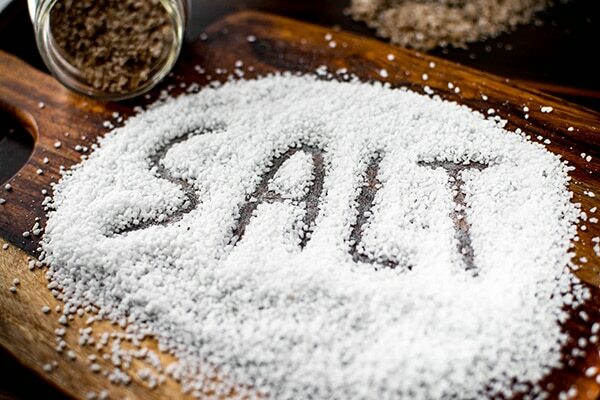 You need flakey sea salt, or coarse salt, your favorite wood for smoking, a BBQ or smoker, and time. When I was trying to figure out how to smoke salt, I used a lot of different woods, a lot of different methods, and went through a lot of salt! Here is a list of what we used to make our favorite applewood smoked salt. We have a Char-griller Akorn Kamado grill/smoker. We wouldn’t replace it with anything because it’s the best BBQ we’ve ever had. It’s fantastic, we love it, I highly recommend it. After three summers of hard wear and tear this thing is still going strong without any issues. My husband smokes everything in that thing – turkeys, cheese, salt, pizza, grilled cheese- honestly if it is food I am sure at some point we tried to BBQ it or smoke it. I also bought a frying pan splatter screen, stainless steel, and bent the handle up so I could put it inside our BBQ. The screen is perfect for coarse salt. It allows the smoke to penetrate at the top and the bottom at the same time. I find this speeds up the process and makes it easy work. How to smoke salt is as easy as pie. Wait, no that’s wrong, it’s way easier. I smoke 2 cups of salt on 300-350 f for 2-3 hours. I stir my salt and add new smoke chips every hour, and I do not soak them. 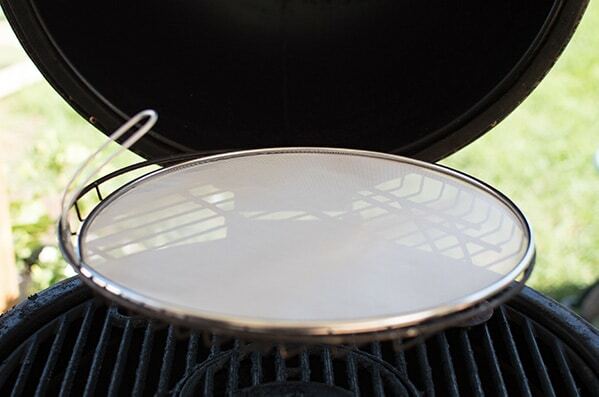 All that soaking will do is delay your smoke and reduce the temperature of your coals.
. The best damn BBQ book ever. It’s where I learned all about why you shouldn’t bother soaking wood and many other unusual tidbits that will take your BBQ game to the next level. How to smoke salt was not a topic in the cookbook, but you can find some of the best recipes for your summer BBQ in that book. Can I smoke salt in a gas BBQ? I am going to recommend that you invest in this beautiful little device. The A-MAZE-N pellet tube smoker allows you to cold smoke in your gas BBQ. I’ve used it in the past, and it works great. It takes pellets, and not wood chips or wood chunks, so that’s an extra investment, but it does turn your gas BBQ into a cold smoker. The salt improves over time. It mellows, gets a bit smokier, and the taste keeps getting better and better. I store my salt in mason jars, and it lasts indefinitely. I have some kicking around from last summer, and it still tastes terrific. Use airtight storage containers if you are storing for long periods of time. 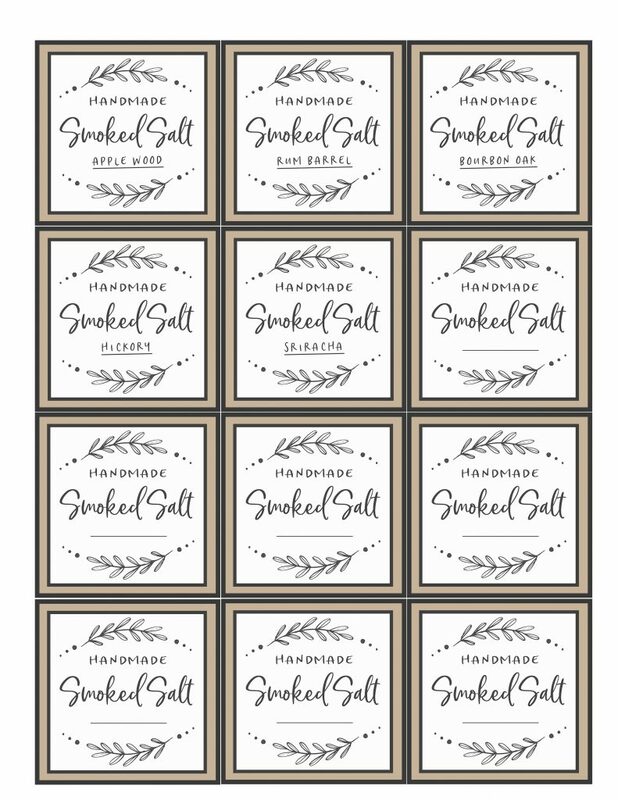 I made these adorable labels that you can print off and add to your jars. You can print them on sticky label paper, but you will need to cut them. A paper trimmer makes quick work of the job. I printed mine on card stock and used a glue stick to slap them on the front of a 500ml (2 cups) mason jar. A bit of craft paper added to the lid and a twist of twine add a nice touch. You seriously need to make a batch! In the middle of winter, when it’s cold outside, you can add a pinch of fire-roasted goodness to your dishes and pretend that it’s still summer. Speaking of pumpkin soup, have you ever tried Cinderella pumpkins? What type of coal are you using or is it wood chips only ? We use hardwood lump charcoal for the heat, and the wood chips for the smoke. Hope that helps Tammie! Hi Stella, I am not very familiar with electric smokers, unfortunately. If you no longer have the manual for your smoker, you should be able to find a copy online which will give the correct instructions for smoking items like salt. Cheers! 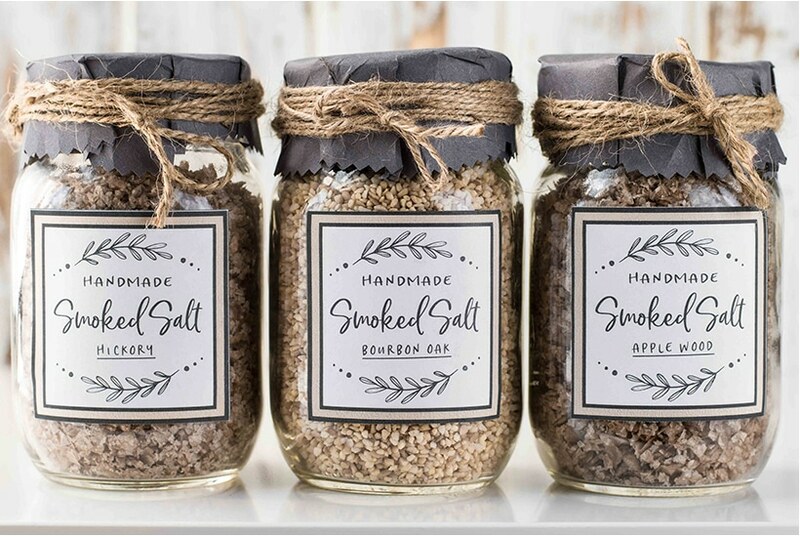 I was wondering if you had ever used smoked salt in place of regular salt during the curing process of making home made smoked salmon…. And if you had what effects it had on the finished result? Maybe even eliminated the need for cold smoking after? Hey Joe, No I have never used smoked salt to cure salmon but I doubt very much it would create the same depth of flavor that a true smoke would. 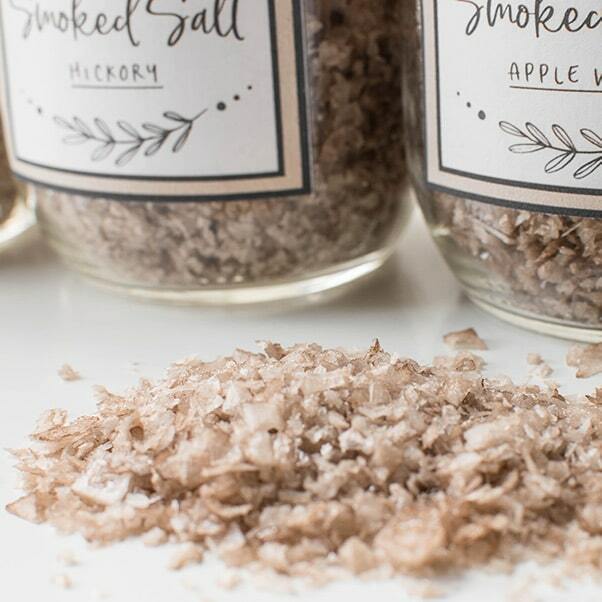 Smoked salt lends a more subtle smoked flavor. I lived in Vancouver for many years and had so many different types of smoked salmon and although it was never my favorite I was always shocked by just how smokey salmon can get. The smoked salt may yield a much less intense flavor that some people (like me!) may enjoy more but true die hard smoked salmon fans may be disappointed at the lack of intensity. Can I use an electric smoker? Hi Becky, yes you can use an electric smoker. I do not have one, so I cannot recommend a process, but you can check the manufacturers’ website for instruction. I think using an electric smoker would yield more consistent results vs a charcoal bbq, but that’s just a guess on my part. Good luck! Yup, you absolutely can Lynn. We’ve done it a few times. It has a nice surface area to absorb the smoke. Time frames are the same. The only thing to know is with coarse kosher salt is it is very dusty. You will want to place your salt on your tray and give it a shake somewhere because it will release lots and lots of salt powder. Don’t do it over the BBQ because it just crusts on your charcoal. Let me know how you like it!